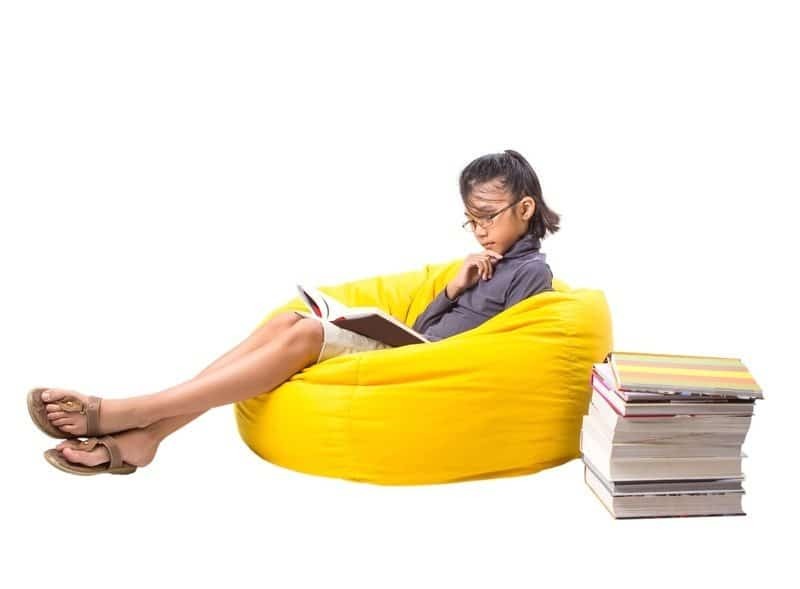 Since beanbags became famous in the 1960s and 1970s, they have been the subject of much debate regarding the health and safety of those who own or use them. However, most beanbags made today, and certainly those sold by reputable merchants, are just as safe as any other type of furniture you would put in your living room, recreation area or outdoor patio. In fact, beanbags are recommended by doctors for their ergonomic features, and they can be used as a form of therapy for individuals with serious medical conditions, such as autism. Even though modern beanbags are made to be as safe as possible and include several safety features, a new scare has been making the rounds on the gossip circuit. Some beanbags packaged for sale in parts of the U.S. have recently been found with warning labels affixed stating that the materials may be toxic or cause cancer. While there is some truth to these labels, it is important to note that this possible safety hazard does not apply to all beanbags – only those made of certain materials, such as vinyl or memory foam. These warnings are mandated in California because of state legislation called The Safe Drinking Water and Toxic Enforcement Act of 1986, more commonly referred to as Proposition 65. Voters passed this law to help protect residents from potentially toxic substances associated with cancer or birth defects. Proposition 65 is widely known as one of the strictest legislation in the world regarding the safety of consumer goods, and its effects have been felt even in Australia. Products that include any of the materials on the Proposition 65 list cannot be sold in California without being accompanied by the above warning. For a substance to be included on the list, there must be research suggesting that it may cause cancer or birth defects in one out of every 100,000 people over a period of 70 years. Proposition 65 is meant only for consumers in California. However, some companies have found it to be more cost effective to include the warning labels on all of their products no matter where they are intended to be sold. Other businesses overproduced items meant for California and sold beanbags with warning labels affixed in other markets around the world. Among the products carrying Proposition 65 warning labels are vinyl beanbags, and this has caused many to question the safety of all beanbags. However, the only items that are of concern are cheap beanbags with vinyl covers or filling made of memory foam. According to multiple scientific studies, vinyl especially when it is used as a fabric, may pose some health risks to consumers. One of the dangers of vinyl is that it may off-gas one of its constituent components: vinyl chloride. Vinyl chloride is a colourless gas that is produced by man for industrial and commercial use, and it is a vital ingredient for making polyvinyl chloride (PVC) and other vinyl products. Most of the vinyl chloride in these products is released during and shortly after the manufacturing process, so exposure is usually only an issue for workers in vinyl factories and similar operations. However, if vinyl or PVC products are released for sale directly after manufacturing, they may continue to off-gas in homes or other enclosed spaces. Vinyl chloride is associated with several diseases and health issues, including brain cancer, lung cancer, lymphoma, leukaemia and a rare but deadly form of liver cancer. Although the risk of developing health problems from vinyl chloride off-gassing from vinyl products is very low, recent studies show that vinyl fabrics pose other potential problems. Before vinyl can be used as a fabric, its flexibility and elasticity must be increased, which is accomplished by treating it with a chemical plasticizer called diisononyl phthalate (DINP). In December 2013, the California Office of Environmental Health Hazard Assessment (OEHHA) added DINP to the 900-item list of substances requiring warning labels as per Proposition 65. This addition occurred after it was reviewed by the state’s Carcinogen Identification Committee (CIC). This review indicates that excessive exposure to DINP increases the risk of several types of cancer, including kidney, pancreatic, uterine, blood and bone cancers. Shortly after the decision was made to include DINP on the Proposition 65 list, the American Chemistry Council (ACC) filed a lawsuit against OEHHA. The lawsuit stated that not enough evidence exists to include DiNP, but at the time of this writing, the lawsuit is still under review. DINP has been studied by many other government agencies and organizations, including the European Chemicals Agency and the National Industrial Chemicals Notification and Assessment Scheme (NICNAS) of the Australian Government Department of Health and Aging. And it was found to pose very little risk to consumers except in cases of aggregate exposure from multiple products. Acetone – Acetone is toxic when it is inhaled in large volumes. Dimethylformamide – Exposure to this substance may cause organ damage. Methyl Benzene – The inhalation of methylbenzene may damage the central nervous system. Vinylidene chloride – This chemical can irritate the respiratory system and is a suspected carcinogen. At Bean Bags R Us, we take the health of our customers and the general public very seriously. Because your health and safety is a priority to us, we do not sell cheap beanbags with vinyl covers or memory foam filler. The majority of our products have covers made of polyester with a polyurethane coating for increased water resistance. Most of our other beanbags have covers comprised of high-quality nylon. In addition, we only use virgin EPS beads to fill our beanbags because they are very durable and pose no medical hazards.